Last year, the Haunted Mansion Holiday debuted a new animatronic in the form of a Sally figure, leaning plaintively against an unexpectedly happy gravestone. 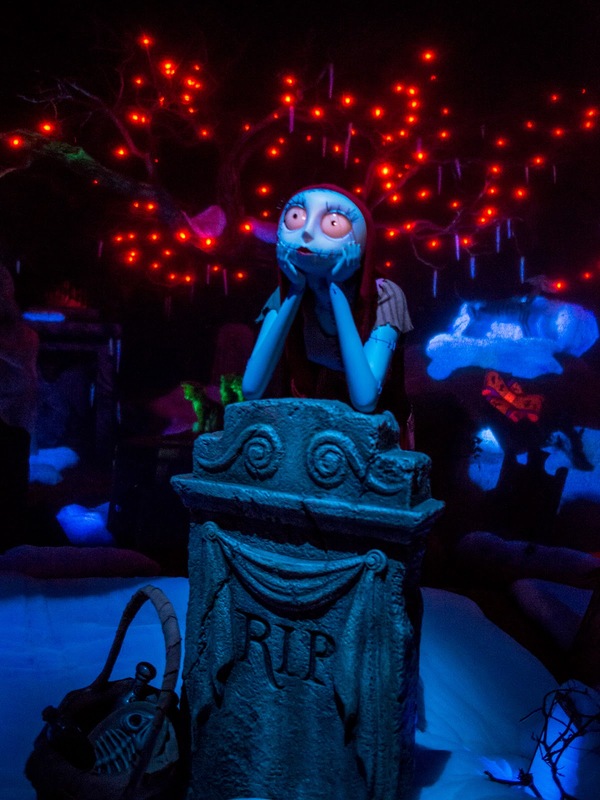 Sally looks wistfully at nowhere in particular, perhaps lost in thought over Jack Skellington. All around her, merry, dual-holiday crooning abounds, but she is detached from it all. Sally is beautifully lit, making photography somewhat easy compared to many other components of this beloved ride. A high contrast creates a clear focus to lock onto, and the ethereal glow of blue and orange behind her provide an eerie but striking composition. It's easy to get lost in the joy that is Halloween, though, so I suppose one can't blame her for daydreaming!